I have an obsession with anything knitted or that looks knitted. Something about the look & feel is so cozy and comforting. As the temperature slowly drops, I start to wear anything that is knitted like a knitted sweater, knitted scarf, and my most recent purchase this knitted J. Crew Factory skirt. I was definitely comfortable in this outfit. I love how this pleated skirt is appropriate for Fall. The skirt is surprisingly not heavy and is actually lightweight. I can see myself wanting to pair this skirt with a pair of Over the Knee boots in the winter. Just the kind of outfit I love to wear! Amazzzz! The colors work so well and love the texture! beautiful! outfit! 🙂 more inspiration for outfits on my blog .. This sweater looks so warm! It's the perfect length too! (: Have an awesome weekend Rach! Thanks Kiki! Hope you're having a great week so far! I love pairing chunky knit sweaters with skirts during the fall and the casual vibe with the loafers. BTW I can't believe they're from Old Navy! Me too! I know, Old Navy is totally killing it lately! LOVING the oversized sweater and soft skirt look. You are SO on trend! oooh love these textured layers! totally something I can see myself wearing this fall/winter to work! I love the double knit! That skirt is too cool. I really like your shoes and hair! I'll have to start getting back into knitted things once it gets a bit colder here. I'm slightly jealous it is still nice there! I'm in love with the look, Rach. Knits have to be my favourite thing to wear, but with the weather being eternally summer here, it's just so difficult! This skirt is a great piece for fall! I really like how you styled it. Love the shoes! Have a great weekend! Same with you, i love knots too! The color suits fall 🙂 You are fab wearing it. Thanks so much Esther! Hope you're having a great week! I have the same type of obsession, believe me. I love this sweater on you and it looks awesome with your skirt. This is such a beautiful outfit! I love knitted looks too…the coziness is always so perfect! This is such a classic fall look! 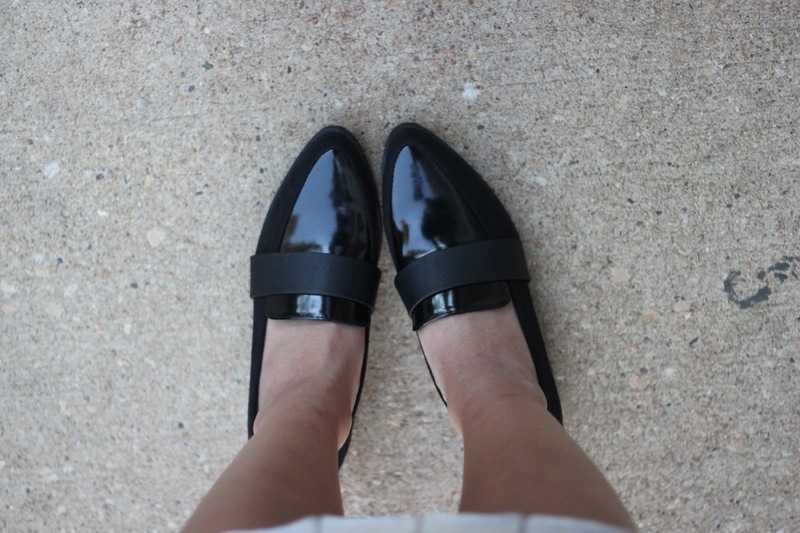 Loving those pleats and those loafers! Perfect fall look, love the sweater! I love this outfit! The colors are subdued and perfect for fall, and I love the bag and the skirt! Your photos are beyond AMAZING!!! You are SOOOOO beautiful! Happy Sunday! i love the mix of the sweater and longer skirt here. and I love the loafers! What a great mixing of textures! Seriously styled so perfectly! I love how you styled this look, the pleated skirt is so cute! Great post! Thanks Fiona! Oh no, I can't believe it is that cold there already! perfect outfit and i too, am a knitted sweater (or anything really) fan!! great color combo. Love the cozy and feminine vibe of this Fall style!